Abtech ZP Junction Boxes and Enclosures are available in 19 different sizes. The ZP Enclosures are injection moulded in either ABS plastic or polycarbonate material. We can also supply an optional clear polycarbonate lid which can be fitted to either base. 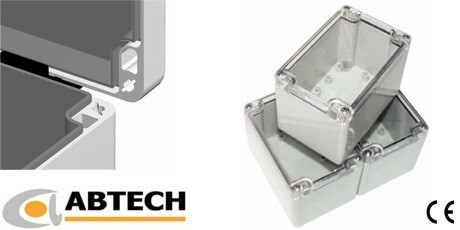 Abtech ZP Junction Boxes and Enclosures are lightweight by at the same time highly robust, providing a good level of protection against corrosion and oil based contamination. Featuring the labyrinth seal arrangement which is found in the Abtech ZAG and BPG Enclosures, the ZP Junction Box can offer protection rated up to IP65. ZP Enclosures offer Stainless steel captive quick release quarter turn screws fitted as standard which provide a quick and reliable method of securing the lid. This method can provide a considerable cost saving in assembly times with on-average savings of 2 minutes per enclosure over conventional screws. However, if required optional conventional threaded screws can be supplied. Abtech ZP Enclosures are suitable for a wide variety of applications which includes junction boxes, instrument enclosures and a multitude of OEM applications. The ZP range is particularly suitable for housing instruments and indicators where a visual indication is required without the need for opening the enclosure due to the optional clear lid. ZP Enclosures can be machined, drilled and tapped with various thread forms, and can also be silk screen printed. Internal components of the ZP Enclosure are located via a series of moulded pillars. The pillars can be fitted with threaded inserts or alternatively can accept self tapping screws. Also these are used for fitting of component mounting plates or DIN standard terminal mounting rails (eg; TS 15, TS 32 or TS 35). ZP Enclosures can be earthed through various means. (Eg; an internal / external earth stud when connected to the terminal mounting rail or component plate can be used or various rail mounted earth terminals or proprietary earth bars which can be fitted inside the enclosure. RFI screening is achieved by a metalised coating to the internal surfaces of the enclosure (50 micron thickness) and the fitting of an RFI gasket. For further information on suitable RFI gaskets and finishing techniques which will provide optimum protection please contact us.